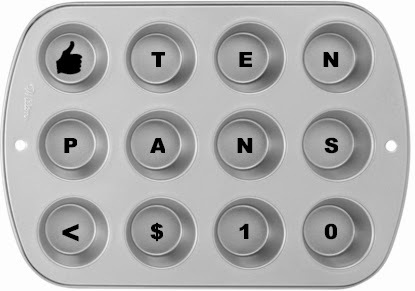 Here are ten baking pans each under $10 on Amazon for your Passover baking needs, all with free Prime shipping..
Wilton Easy Layers! 9" x 13" 2-Piece Set Sheet Cake Pan, $6.44, 4.4 out of 5 stars over 447 customer reviews. Baker's Secret Signature Cook 'N Carry Oblong Rectangular 13" x 9" x 2" Pan, $6.81, 4.3 out of 5 stars over 378 customer reviews, and an "Amazon's Choice" item. Wilton Recipe Right Nonstick 12-Cup Regular Muffin Pan, $6.81, 4.7 out of 5 stars over 1,081 customer reviews. Cuisinart 9: Chef's Classic Nonstick Round Cake Pan, $6.93, 4.6 out of 5 stars over 288 customer reviews, and an "Amazon's Choice" item. Baker's Advantage 0.4mm Carbon Steel Sheet Cake Pan, 9" x 13", $6.99 (not reviewed yet). Wilton Perfect Results Large 9.25" by 5.25" Nonstick Loaf Pan, $7.69, 4.8 out of 5 stars over 73 customer reviews. Wilton Perfect Results Premium Non-Stick 12-cup Muffin and Cupcake Pan, $8.01, 4.6 out of 5 stars over 63 customer reviews, and an "Amazon's Choice" item. Cuisinart Springform 9" Cake Pan, 9", $9.50 - $0.32 coupon = $9.18, 4.7 out of 5 stars over 5 customer reviews. Cuisinart Chef's Classic Non-Stick Fluted Bundt Pan, $9.50 - $0.32 coupon = $9.18, 4.6 out of 5 stars over 312 customer reviews. Wilton Perfect Results Non-Stick 24-Cup Mini Muffin and Cupcake Pan, $9.50, 4.7 out of 5 stars over 215 customer reviews.